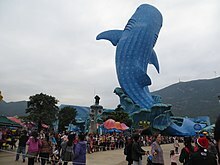 Chimelong Ocean Kingdom is a theme park situated in Hengqin, Zhuhai, People's Republic of China. It is designed by PGAV Destinations. The park broke ground on 28 November 2010 and soft-opened on 28 January 2014. The grand opening occurred on 29 March 2014. The first phase of the park cost RMB 10 billion to build. It is part of the Chimelong International Ocean Tourist Resort, which aims to become the "Orlando of China". According to TEA and AECOM, it is the 11th most visited theme park in the world in 2017, with over 9.7 million visitors. Among its attractions are a wide range of amusements rides, animal shows, as well as the world's largest oceanarium with a total of 48.75 million litres (10.72 million UK gal; 12.87 million US gal) of water. The theme park currently has five Guinness World Records under its name. There are eight themed areas inside the park, each representing a part of the ocean. 5D Castle Theatre - Opened in 2015. The castle theatre features a 13-minute animated film called "Kaka's Great Adventure". The film is produced by Prana Studios with Kraftwerk Living Technologies (KLT) providing the hardware. The theatre has a 1,500m² curved screen, a world record. The theatre took more than three years to plan and cost some ¥300 million (US$50 million) to build. Whale Shark Exhibit Aquarium – the tank itself contains 22.7 million litres (4.99 million UK gal; 5.99 million US gal) of water, making it the largest in the world, and it is home to whale sharks, manta rays, and many other species at the time of its opening. Sea Bird Paradise – Home to pelicans, white cranes, white-naped cranes, white storks, herons, spotted seals, capybaras, green sea turtles, African spurred tortoises, Aldabra giant tortoise and seagulls. Journey of lights - Night time parade designed by Miziker Entertainment. Opened in March 2017, the facility is home to nine killer whales (5 males and 4 females), 6 currently living at the center and 3 temporarily held at another facility. All the killer whales came from Russia and will live here until their new home opens next year. Two are named Nukka (F) and Tyson (M). Others' names have not been made official yet. 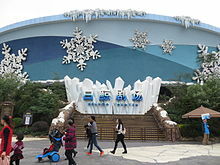 In 2015 Chimelong Ocean Kingdom won the Thea Award for Outstanding Achievement over 169 international candidates, marking the first time the award was given to a Chinese theme park. The ocean park holds the Guinness world record for being the largest aquarium in the world, it also had the largest aquarium window in the world according to the Guinness World Records, a single acrylic panel measuring 39.6 by 8.3 m (130 by 27 ft). The Journey of Lights parade won the 2018 Thea Award for outstanding achievement - live show. Samuel Hung Ka-yiu, chairman of the Hong Kong Dolphin Conservation Society, said, "Ocean Kingdom seems to have imported everything. They are doing everything wrong. They are doing everything you don't want them to do". Examples include polar bears confined in small areas demonstrating "repetitive pacing, swaying, head-bobbing or circling" and skin disorders in penguins kept in a sub-tropical environment. Further criticism arises from a recent trade of orcas between China and Russia. In 2013 Russia captured wild orcas in the Sea of Okhotsk, two of which have been sold to China. "Now, a conservation group monitoring the capture of killer whales says it has discovered that Convention on International Trade in Endangered Species of Wild Fauna and Flora (Cites) permits were applied for by Russia and granted for two wild-caught killer whales, also known as orcas, to be exported to China." Ocean Kingdom refuses to comment on whether they plan to display orcas in future but there are currently 50 aquariums in China, none of which have orcas on display. ^ "TEA/AECOM 2016 Global Attractions Attendance Report Report" (PDF). Themed Entertainment Association. 2018. Retrieved 16 April 2018. ^ a b Brady MacDonald (17 July 2013). "Huge Chinese theme-park project aims to be the 'Orlando of China'". Los Angeles Times. ^ a b "Hengqin ocean resort to open in 2013 29/11/2010". Macau Daily Times. 29 November 2010. ^ "Hengqin: Chimelong Ocean Kingdom to open before CNY". Macau Daily Times. 13 January 2014. ^ a b "TEA/AECOM 2017 Theme Index and Museum Index: The Global Attractions Attendance Report" (PDF). TEA (Themed Entertainment Association). 2018. ^ a b "China's Hengqin Ocean Kingdom confirmed as world's largest aquarium as attraction sets five world records". Guinness World Records. 31 March 2014. Retrieved 9 November 2017. ^ Michael Switow (June 2015). "Chimelong Ocean Kingdom - June 2015". IAAPA. ^ "Largest Aquarium Window". Guinness World Records. Retrieved 31 March 2014. ^ Kleiman, Joe (11 November 2016). "Miziker Entertainment Brings Decades of Nighttime Parade Expertise to Chimelong Ocean Kingdom's Journey of Lights". InPark magazine. ^ "Chimelong Ocean Kingdom wins 2014 Thea Award". Hengqin.gov.cn. Retrieved 5 August 2015. ^ "Thea Awards 2018". Themed Entertainment Association. ^ a b Simon Parry. "Could Zhuhai's new Ocean Kingdom create a market for imported killer whales?". Post Magazine. Retrieved 11 February 2014. ^ "Zoochosis: Abnormal and Stereotypic Behaviour in Captive Animals". Born Free Foundation. ^ "Ocean Kingdom in China Could Become World Leader in Importing Killer Whales". Coaster-net. 5 March 2014. ^ "Message board". Russian Orcas Homepage. 13 October 2013. ^ "TEA/AECOM 2015 Global Attractions Attendance Report Report" (PDF). Themed Entertainment Association. 2016. Retrieved 3 June 2016. ^ "TEA/AECOM 2016 Theme Index and Museum Index: The Global Attractions Attendance Report" (PDF). TEA (Themed Entertainment Association). 2017. Photos: Chimelong's Ocean Kingdom theme park in China Los Angeles Times. This page was last edited on 21 April 2019, at 03:23 (UTC).